Here is a 1944 advertisement for Dunlop Tires which contains some tips for tire maintenance which are still valid today. At the time this advertisement appeared in 1944, Canada was at war and many products, including tires, were rationed. 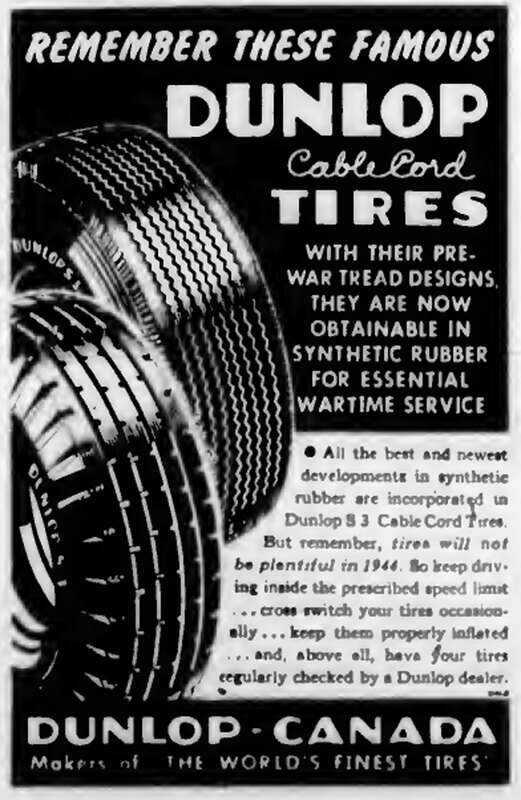 Dunlop’s tire maintenance suggestions were intended to conserve tires and extend tire life because, as the advertisement says, tires were scarce due to wartime rationing. But these tips are still true and all drivers should be aware of them. “Keep driving inside the prescribed speed limit” – this is still true today; tire wear increases, and tire life decreases, measurably at higher speeds, i.e. above 90-100 kph. “cross switch your tires occasionally” – still true today; rotating your tires from front to rear, and vice versa, is still a recommended practice today. Ask about it wherever you have your vehicle serviced. “keep [your tires] properly inflated” – still very true today. Check your tires regularly to ensure they are properly inflated. Tire pressures over, or under, the recommended tire pressure(s) can have a very significant effect on tire wear and performance. So the tire maintenance tips given in this 1944 Dunlop advertisement are still true today. We will put out a video about this in future.